Candy Land: Dora the Explorer Edition Game Review - Download and Play Free Version! Great learning device for younger players. Spanish is incorporated in a learning manner. All the text is explained in dialogue for non-readers. 2 modes of the game with multiple difficulties. Way too easy for older players (third grade and older). A lot of the dialogue is not needed and slows the game down. Join Dora on a Delicious Adventure! Help Dora the Explorer and her fun friends, Diego, Backpack and Boots, travel through Candy Land to a fiesta! Experience the classic enjoyment of the Candy Land board game but Dora-style with Benny's delicious candy canes, Tico's tasty peanuts, Iso's lollipops and more. This game is great for children ages three to six and also fun for older friends and family. Play single player against the computer or play with up to three other friends. Just like in the Candy Land board game, each turn consists of drawing a card with a colored square on it and moving to the nearest square of that color on the board. Once a player passes a figure, such as Abuela, an educational mini game pops up. Play a memory game to pass the Grumpy Old Troll, bake with Abuela and learn counting and colors with other adorable characters. Watch out for Swiper because he'll steal away one of your turns! The game ends when a player reaches the final square and then everyone goes to the fiesta! This game makes learning fun because kids will adore the cute characters and their enjoyable, educational mini games. They can practice necessary skills like counting, learning colors, logical thinking, memory and even learn some Spanish. Play along with your kids and experience the laugh-out-loud fun of competing to finish first and shouting out answers together! For a fun-filled, tasty trip into Candy Land, join Dora and her friends now! 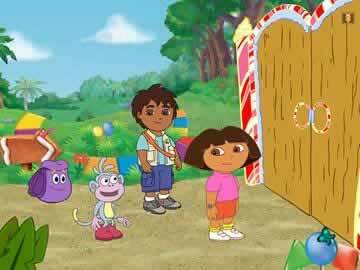 Help Dora, Bender, Backpack, and Diego make it to Dora's abuela's (grandma's) house for la fiesta (the party) in this Candy Land adventure. Candy Land: Dora the Explorer Edition is the classic Candy Land board game with added mini-games and an educational emphasis. This game's simple nature and teaching elements make this a perfect game for a family with young children, just learning to read. Candy Land, one of the all time great children's games, is a turn-based game that has you advancing along a playing board to reach the end goal. 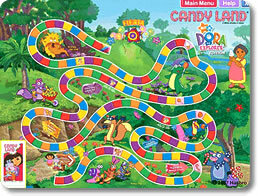 In this version of Candy Land your goal is to help Dora make it to her grandmother's house for a party. To move you pull a card from the deck and advance to the color it shows. Cards with two colors allow you to advance farther than you normally would and cards with symbols allow your character to advance to that symbol on the board. The symbols are scattered throughout the game tiles and pulling one can give you a huge advantage, especially the cards' symbols that are really close to the party. Dora the Explorer edition offers two modes of play which include both the classic game as well as an enhanced version with educational mini-games. The enhanced version is essentially the same game as the original, however, in this version you must complete tasks or answer riddles to advance. The tasks are typically educational and might have you collecting candy canes in the shapes of letters or placing different colored lollipops in order to complete patterns. Each of the games have an educational element and pose a challenge for younger players. Older users will more likely than not find the mini-games too easy. The educational element in Dora the Explorer Candy Land is great. This game is designed for younger players just learning to read. You can see learning in nearly all aspects of the game. Dora counts in both English and Spanish, colors need to be identified, learning and comprehending is emphasized, even the instructions are read so new readers can read along and sound out words. This game is a great learning device and young children will get a kick out of how learning is incorporated into this fun board game. If you are an older player, Candy Land: Dora the Explorer edition does not have much to offer. This game is designed for younger players so there is no real strategy or challenge. Even when you set the difficulty to the hardest setting, if you are an older speller you will find this game to be incredibly easy. Also, because this is a learning game for younger users, older players may get annoyed with the dialogue and the long length of turns. Though this is typically a major flaw of games, having drawn out dialogue after every turn is a great educational tool. 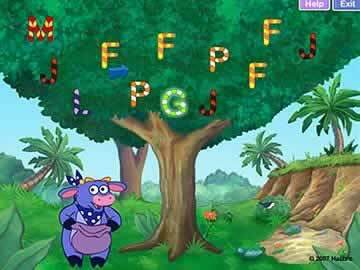 Candy Land: Dora the Explorer edition is a great game for young children learning to spell. This might be the perfect addition to your family's game collection because it is educational and fun to play. Older players will not gain a lot from this game, however, it is not directed toward them. This fun game is a perfect learning device for developing children, and is worth the download. Check out some of the fun and educational gameplay in Candy Land: Dora the Explorer Edition.